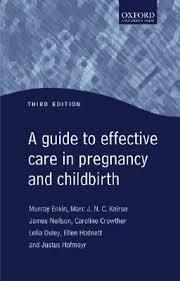 This third edition of A guide to effective care in pregnancy and childbirth has been completely updated to include research evidence that has appeared since publication of the previous edition. Based on systematic reviews of the research literature, it summarizes the most authoritative evidence available on the effects of care practices carried out during pregnancy, childbirth and after the baby is born. Written in a clear and readily accessible manner, it will be invaluable to anyone involved in the care of pregnant women and to expectant parents themselves. The book concludes with tables listing practices which are clearly beneficial, those which appear to be promising, those of unknown effectivenes ant those likely to be ineffective or harmful.